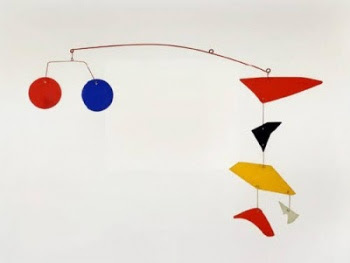 Alexander Calder (1898-1976) was an abstract sculptor known by his "mobiles toys". After learnt a little bit more about his work, we started a new project about these mobiles, but we added a new objetive: it could be like painting something in the air, working 3D, able to understand only from a point of view (like a mobile with a secret message). We made a solar system too, and we had to study the shapes and the sizes of the planets, remembering their characteristics in order to build them as they look. It was a beautiful process, sometimes hard, where we had to trust our patient and know that we are capable of doing anything we want to. The results were amazing, we have decorated our classes with them, and we are so proud of our works!